Dentures that slip and slide, that tooth you got knocked out playing football last Thanksgiving, those back teeth that were lost to tooth decay, they all have something in common – left unfilled, they’re harmful your oral health. Patients give all kinds of reasons for not replacing lost teeth, but the long-term health effects can be severe. Don’t put off tooth replacement, restore form and function to your teeth with dental implants. They don’t just fill the gap left by missing teeth, they actually help to maintain bone density and restore gum tissue. Call the top notch staff at Allheart Dental Care in Red Oak, TX to schedule a dental implant consultation. Patients who loose teeth are frequently concerned about infection or their smile esthetics. Many don’t even know about the detrimental hidden effects of tooth loss. Missing teeth can allow dental drift or shifting and movement of remaining teeth. When your adult teeth shift within your mouth, the surrounding teeth may gap or overlap changing your bite. This can be painful, and undo costly orthodontic straightening. Replacing missing teeth quickly helps to maintain your smile for years to come. Without the root to support gum tissue and stimulate the jawbone to maintain density, there is usually significant deterioration over time. The absence of a tooth and the deterioration of the gum and bone can change the shape of your face because there is less bone and gum tissue to support and shape your facial structure. Bone loss is also associated with TMJ which can be very painful and requires extensive treatment. Single tooth replacement and the replacement of two or three teeth has been done using crowns and bridges. This technology is still relevant and can successfully replace missing teeth. However, traditional crowns and bridges often inhibit chewing ability, and because they rely on the surrounding teeth for support, are less effective at retaining gum tissue and bone density. Dentures too are effective tooth replacement for full arches. However, they come with numerous hassles and inconveniences. Because dentures cover the pallet, they change the way that food tastes, even with improved dental adhesives, dentures still shift and slide over time, and you are very limited in the kinds of foods you are able to chew effectively. Where traditional crowns and bridges and dentures fall short dental implants shine. 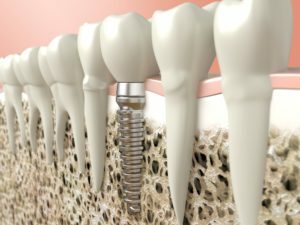 The implant works by imitating your existing teeth. A titanium post is inserted into the gum. Over the course of several weeks, the post will fuse to the jawbone in much the same way that replacement hips and knees fuse to the existing bone. For a single tooth, a customized porcelain crown is permanently anchored to the post, and restores full function to your bite. You can eat with and clean the crown the same way you would your own natural teeth. Implant supported dentures are anchored to several posts that fuse to the jawbone. Once the posts have fused, a complete set of customized dentures are connected to the posts. While some foods may still prove difficult to eat at first, most patients report no problems chewing even the most difficult foods once they are used to the implants. Most patients who are healthy enough for routine medical procedures are candidates for dental implant treatment. However, there are numerous factors that help us determine whether you will be a successful candidate for implants. The only way to know for sure, is to schedule a consultation with our knowledgeable dentists today. Our conveniently located Red Oak, TX practice welcomes customers from nearby communities including Lancaster, Ovilla, Glenn Heights, Desoto, Waxahachie, and the Dallas/Fort Worth Metroplex.